Ah, aebleskivers. Also known as one of the best breakfasts I've ever made! 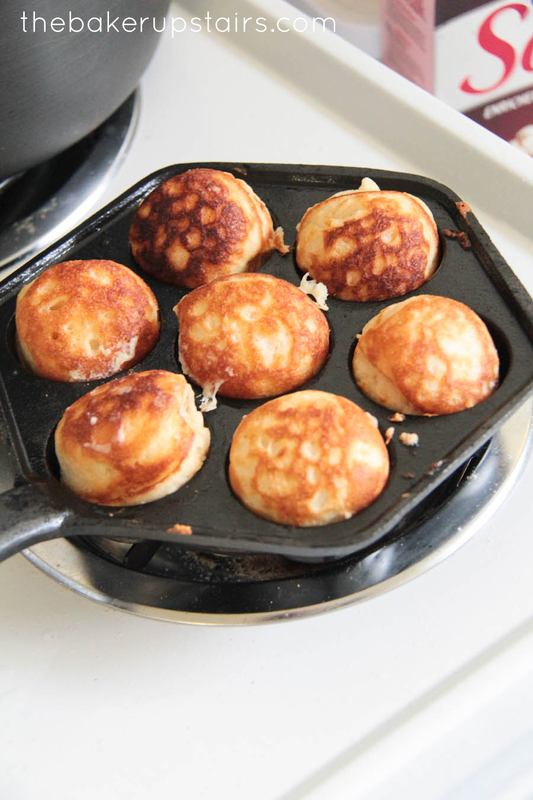 Aebleskivers are a traditional Danish pancake, made in a specially shaped pan. I had never heard of them until about a year ago, when they started popping up on some of my favorite blogs. Geoff's family is Danish (and proud of it!) so when my mom gave me an aebleskiver pan for Christmas (after a few not-so-subtle hints from me...) I was excited to help him celebrate his Danish heritage. 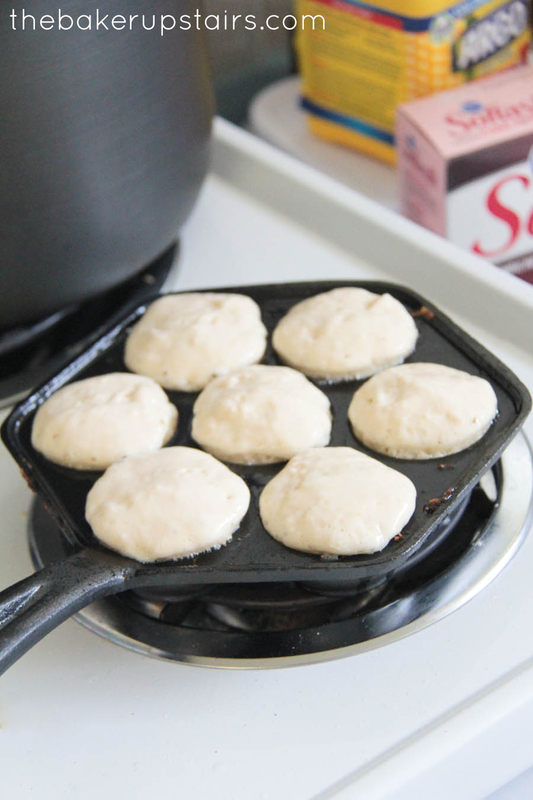 If you don't have your own aebleskiver pan, you can buy one similar to mine here on Amazon. 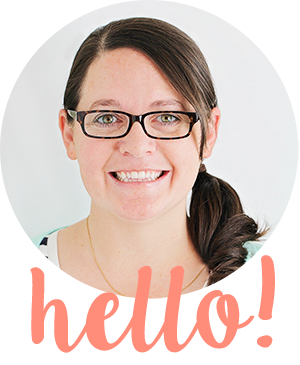 I searched for a long time for a good recipe that wouldn't be too difficult, and finally found one from my awesome friend (and super great recipe source), Emma. Surprisingly, though, as tricky as they seem, they're actually pretty foolproof! 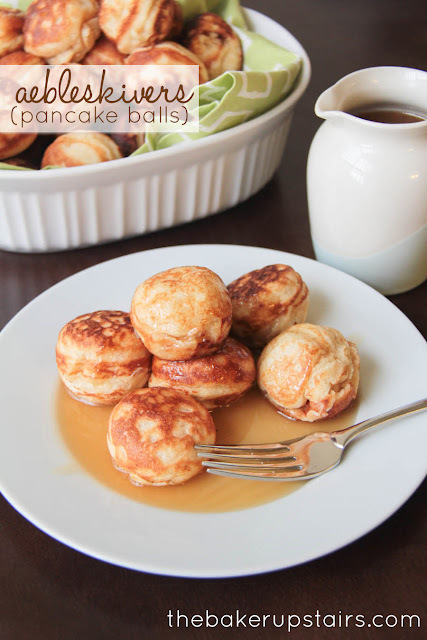 I found it easiest to turn them with a fork, and once I got into the groove of rotating them in the pan, I started getting excited about my beautiful golden pancake balls. Yum! As much as I feared that I had ruined them, each batch of aebleskivers came out perfectly! We ate them hot with some homemade buttermilk syrup and it was an amazingly delicious breakfast. They're a little too much work to have very often, but I think they'll make the perfect breakfast for birthdays, holidays, and special occasions! Heat the aebleskiver pan on the stove top over medium heat. Beat the egg whites until stiff and set aside. Whisk together remaining ingredients, then gently fold in egg whites. Add a small amount of oil to the bottom of each well of the pan (enough to make a spot of oil about the size of a penny in the bottom) then add 1 - 1 1/2 tablespoons of batter to each well. When they start to get bubbly around the edges, use a fork or a knitting needle to rotate them in the pan. This part can be tricky and a little frustrating, but keep at it. Continue to rotate the aebleskivers until they are cooked all the way around and a toothpick inserted into the center comes out clean. Remove from the pan and serve hot. These are also fun to stuff with strawberries, whipped cream, Nutella... anything that sounds good! 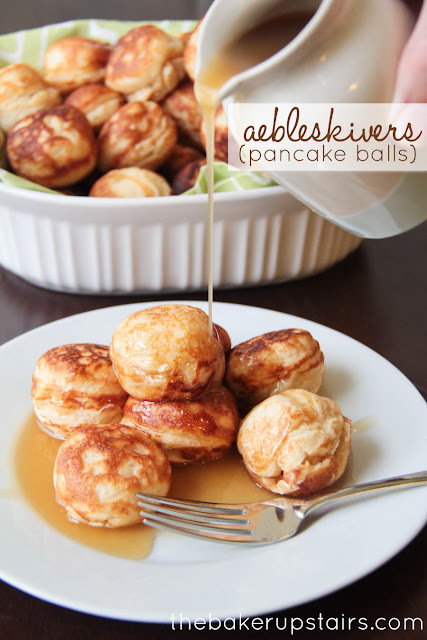 I'd heard of aebleskivers before but never knew what they were! Know that I know, I can't wait to try them! I love learning about international foods! These look like a fun breakfast but I don't have room for another specialty pan. I think I may play a bit and try your aebleskivers recipe in a cake pop pan in the oven! Pour liquid and remaining ingredients together in a jar, except the egg whites. Total blend for 2 minutes. Whipping or all of the ingredients to a thick thickener. Let dough rest for ½ hour. Whip the whites until very stiff. Friend them in the batter. Pour batter into a jug. Melt the butter for baking. Warm apple slice pan up. Pour 1 tsp. melted fat in each hole. Filling the holes 1/4 of dough. batter that apple slices to form loop on the other side. Turn constantly apple slices so they are evenly baked. If you want to honour his Danish heritage even more, you should call them 'aebleskiver', because that is the plural form of them :) They are a very traditional Christmas food, and are almost exclusively eaten then and most of the time, only with jam and/or powdered sugar. 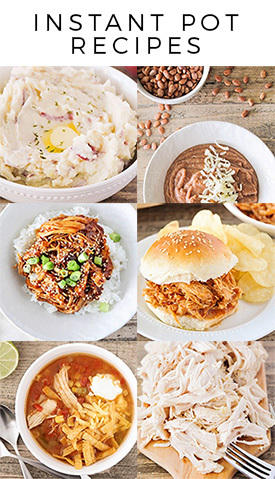 Thank you for the recipe and I hope you enjoy them! Could you use a cupcake pan either mini size or regular size? Does it need to be ball shaped? I wouldn't suggest using a cupcake pan. The special pan is what makes them into aebleskiver (sort of like you can't make waffles without a waffle iron). The batter is really similar to a pancake batter, though, so I think they would be delicious just cooked on a griddle like pancakes.